The tradition of the “Jack-O-Lantern stems from England, Ireland and Scotland where ghostly flickering lights, a natural phenomenon known as “ignis fatuus” or “fool’s fire” might be seen in the distance over bogs, swamps or marshes and would disappear upon approach. It was thought to be trying to lure nighttime travelers off the safe roads. In Ireland, the story goes that an unsavory character named Stingy Jack kept tricking the devil into not claiming his soul upon death. When he got to heaven he found that God didn’t want him because of his misdeeds, so he was condemned to roam the earth with nothing but a burning coal to light his way. He carved a turnip into a lantern and became known as “Jack O’ the Lantern”. People were so afraid that he was coming to get them that they would carve their own pumpkins to scare him off. Across Britain and the continent, people started making their own spooky lights from various indigenous hard vegetables that were carved out and lit with candles from within. Immigrants to America brought the tradition with them and began using locally grown pumpkins which were larger and easier to carve. 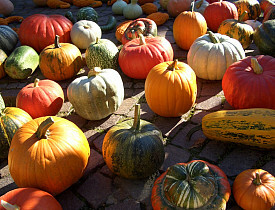 Gourds: Hard-shell gourds are one of the earliest domesticated crops although they are not very edible. Their hard-shell surrounds relatively little soft flesh which quickly dries out within the shell. For this reason, they have been used more as percussion instruments and utensils. Hollowed out gourds also make for long lasting candle lanterns and very artistic patterns can be carved into the exterior shell. Rutabaga: This root vegetable, also known as a turnip, features a bulbous shape with a thick skin. There is a carved Irish Halloween turnip lantern on display at the Museum of Country Life in Ireland that would be certain to frighten anyone in the dark. http://en.wikipedia.org/wiki/Rutabaga Although smaller, rutabagas can be carved in a similar fashion as pumpkins, and their gnarly skin makes them all the more frightening. Martha Stewart, who is well known for her love of Halloween, has instructions for carving and hanging these ghoulish little heads in trees so they appear to be floating. Avocados: While certainly not traditional, a very ghoulish visage can be carved into the dark green skin of an avacado revealing the lighter green flesh and the red brown nut at its core. Pineapple: How about a tropical and prickly Pineapple Jack-O’Lantern? It’s hard exterior and soft-fleshy interior will carve as easily as a pumpkin and it’s leafy “hat” will cast a crazy shadow. Linda Merrill is an interior designer who works with Boston-area tile contractors and painters.